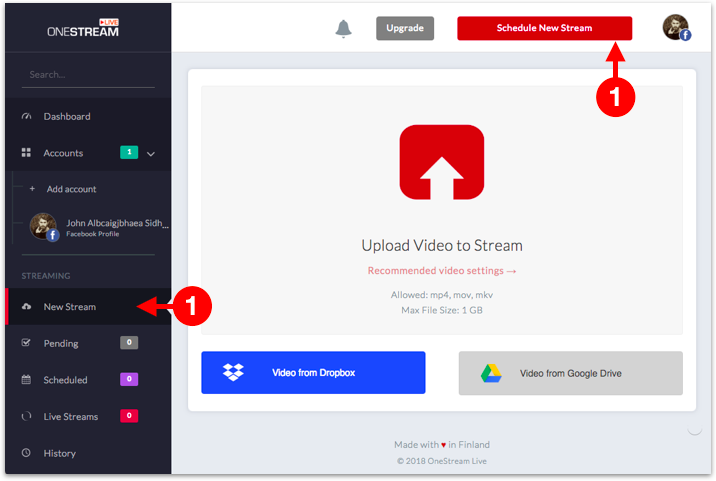 How to upload and schedule a video for live streaming? How are tags displayed on my live streams? How to disable pop-up blocker? How to get embed code for a live stream? How can I modify scheduled streams? How can I change my OneStream login email address? How can I delete a scheduled stream? Upload directly from your computer or device (Video size limit: 1GB). Using video already uploaded to cloud storage like Google Drive or Dropbox (No video size limit). Either click New Stream from the sidebar or Schedule New Stream button. 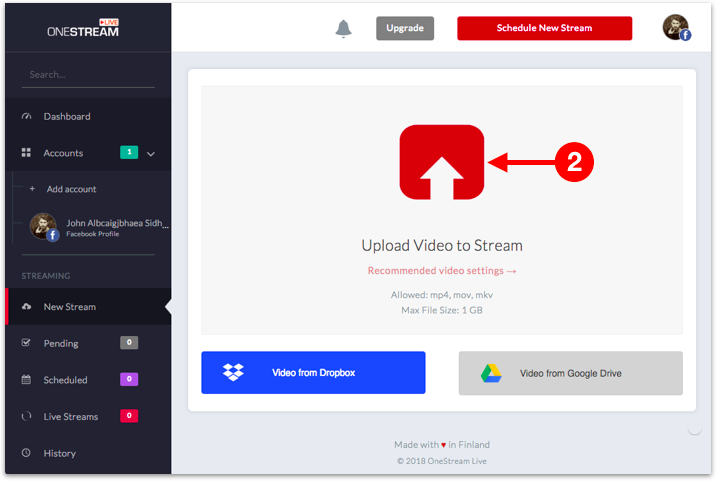 Upload from your computer or choose the video stored in your cloud storage (Dropbox or Google Drive). Allowed video formats are mp4, mov, mkv. Date & Time when the live stream is planned to start. If you want the live stream to start immediately, do not change it. Time Zone. If not selected, current time zone will be selected automatically. Social Account Selection. Multiple social accounts can be selected. 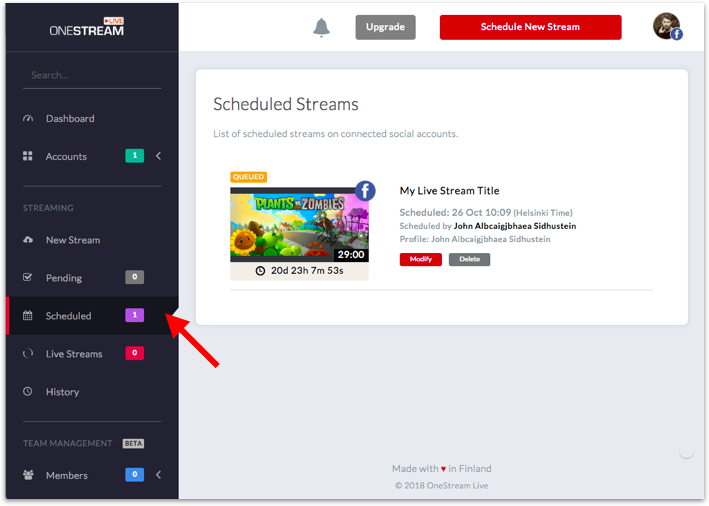 Once you are done with the settings, click Schedule Stream button on the bottom right. Scheduled streams will appear in the Scheduled section. 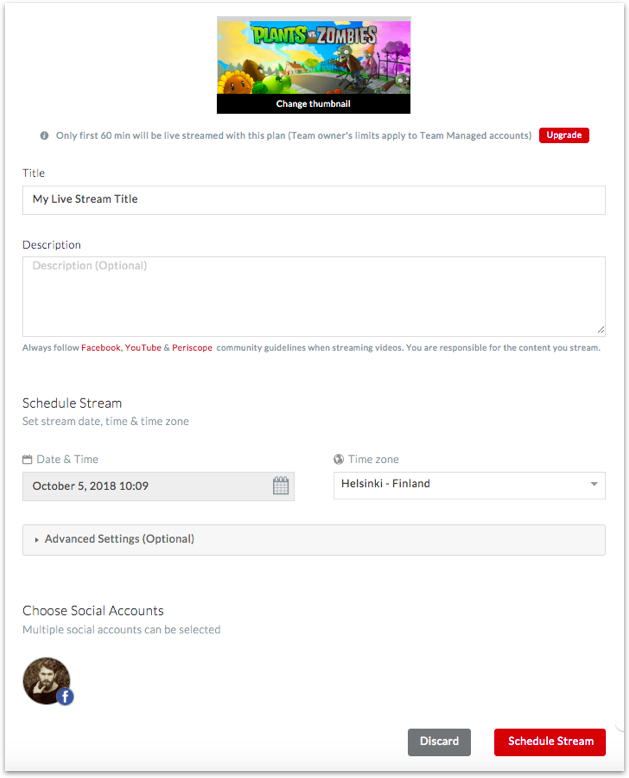 Event Notification: Select minutes, hours or days when you want the announcement to be sent on Facebook or YouTube letting your subscribers know when you plan to go live. 180 or 360 degree videos: If you have uploaded a video recorded with 360° camera, you need to select this option so it can be correctly viewable. Delete Stream / VOD: If you want the video to be removed immediately after streaming is finished. DVR Option If you do not want the viewers to pause, rewind or play live stream from any point you can uncheck this option.